Will detect watered-down spirits in less than two minutes. When you buy a bottle of spirits, you can be sure that it left the distillery in perfect condition. But, as you know, anything can happen when the bottle is open. In fact huge sums of money may be lost each year, due to tampering by dishonest staff, affecting both profits and customer satisfaction. As a licensee, you could even lose your licence! Trading Standards officers use them; Stocktakers use them; you too can combat alcohol fraud using this simple tool! The Reeves Bar Hydrometer set is compact and easy to use, detecting the watering-down or adulteration of spirits at retail strength in a test which takes less than two minutes. Will also help to indicate the substitution of low strength or “own-brand” spirits for full strength premium brands, or the use of higher strength illegal imports. 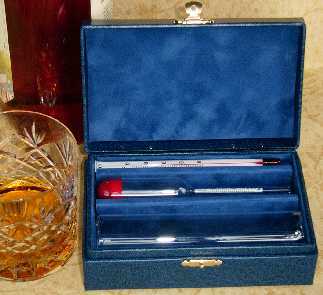 Every Pub, Club, Casino, Restaurant and Hotel bar should be equipped with the Reeves Bar Hydrometer test set. Regular checks at unexpected times will encourage staff honesty and keep them on their toes. The bar hydrometer not only detects adulteration but also acts as an effective deterrent. 130mm, range 940–960kg/m³ at 20°C, graduated in divisions of 1kg/m³, for testing normal strength spirits (33-45%). For testing spirit, a 75ml sample is required. To convert density reading (kg/m³) to % alcohol by volume. The above are also available separately as replacements. Both hydrometer and thermometer are individually numbered and the hydrometer is certified to a traceable standard, and supplied with a certificate of conformance. The standard hydrometer may be complemented by the addition of a second hydrometer for higher strength spirits, a saccharometer is also available for testing beer. 130mm, range 920–940kg/m³ at 20°C, graduated in divisions of 1kg/m³, for testing higher strength spirits up to 55%. 130mm, range 1000–1020°, graduated in Degrees of Specific Gravity 20/20°C, for testing beer. A sample of the spirit to be tested is poured into the test jar, and stirred with the thermometer. The Hydrometer is inserted and allowed to float. The temperature reading and hydrometer reading are taken and the results compared with the chart which will provide the strength in % alcohol by volume. The chart is suitable for all spirits such as gin, vodka and whisky whose alcohol content is not obscured by a high level of sugar, caramel or other solids.